I’m really enjoying Sandy Millin’s blog Infinite ELT Ideas, where she gives us a prompt, such as a toy a photo or a website and asks us to come up with ideas of how we could use it for a class activity. I always enjoy reading blogs that give practical advice and ideas that we teachers can use in our everyday lives. With that in mind, here’s my homage to (or copy of!) her idea. 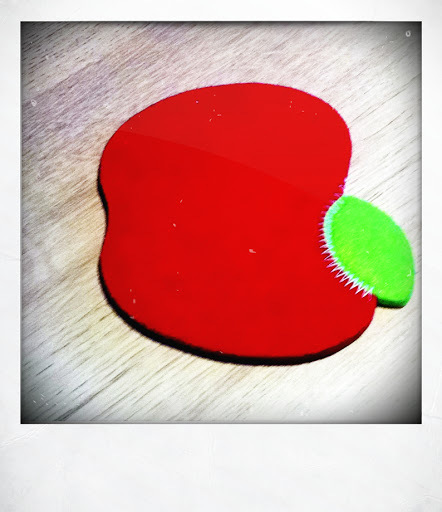 I’ve started using this apple shaped drinks coaster in a one to one class. What do you think I’m using it for? How would you use it in your classes? Update: So here’s how I use it. My student has a particular pronunciation problem that, despite drilling and other pronunciation activities keeps recurring. The student can deal with the problem when they think about it, but in other activities it gets forgotten and comes back. I leave the apple on the table between us. Rather than interrupting her or even saying anything at the end of the sentence when the problem has occurred, I wait until the sentence is over and then calmly put my hand on the apple. The learner knows this is my signal to go back and try the sentence again, and they know exactly what the problem is. By doing this, I’m minimising the interruption as much as I can while dealing with the issue. If anyone can remind where I got this idea from, I’d be grateful! as one of Sandy's infinite ideas, that fish… I think it could be used as prop of some sort. Or possibly you don't like , and you're using it as a scapegoat for a lesson on expressing pet peeves. I'm puzzled, look forward to what others will say, and can't wait to see what u really used it for. AND sandy's turning the blog into a more dynamic environment, crowd-sourcing, and keeping it short and sweet…. BRILLIANT. I'm intrigued by how you use the coaster. Apart from putting hot drinks on it, I think you might use it to hide things underneath. Then you can gradually reveal it and the student has to guess what word / sentence / definition it is. Thanks Brad, but you couldn't be more wrong about my feelings towards Apple Inc! Sandy, my pleasure and keep up the great work on your blog. I don't use it to hide things, but I like your idea and you've given me something to ponder. I wonder if anyone else has an idea? Okay, here is my try. You could have used it to generate questions like: When did you get it? Did you buy it or was it a present? Who gave it to you or why did you buy it? Or alternatively: What's the story behind it told from the perspective of the coaster, using lots of narrative tenses. And I thought it was really clever how you found a way to use the apple and not interrupt your student when he is talking, but he stills goes back and corrects himself. Loved it – and will find my version of the apple for a 1-1 student I have with a similar problem. Thanks Ceci. That's very much the idea, because it would be so easy to be annoying and intrusive when trying to tackle this problem. The apple gives me a way to do as subtly as I can.